I haven't written for ages, have I? I have found it really difficult getting into a routine working for myself. I don't always make time for the things that I love; one of those things is writing. I am going to try really hard to discipline myself to blog more regularly. I know we all agree that with instagram it is easy to neglect our blogs, given that IG has been described as a form of micro-blogging. I love instagram but I can lose hours there but there is something missing that only real blog posts can offer. I still prefer to read well-written blog posts, I find them comforting and cosy to read when I'm queuing at the shops, having a coffee or off to bed. I don't always want the quick and easy version that instagram offers. Posie Gets Cozy is my absolute favourite blog. I love to read Alicia's words, I think she has an inspiring life as a fellow maker. I share a lot of things in common with Alicia and love how she appears to make the most of every day by making the little things special... It is something that I try to do myself too. I had considered vlogging but I don't think that's me. I like to make little videos of what I'm up to and where I've been every now and then but there is no way that I can just sit in front of a camera and chat. I have tried and I just don't feel comfortable. I feel awkward and exposed. I talk to myself at home all the time and I've spent years pretending to run a cookery show in the comfort of my own kitchen! (I think I used to drive my mum mad emptying all the weighed ingredients into separate little bowls for my 'shows'). For some reason when there is an actual real-life camera in front of me I just feel like a wally. And that is that. Summer is passing for us in a blur of salted caramel ice creams, fruit cider, long dog walks in the late evening and lots of cool showers. Electric fans whirring, duvets relegated to storage and small posies of roses at our bedside. Brocantes, antique fairs and car boot sales. Fresh sourdough loaves and my favourite Portugese custard tarts. Watering the roses, sweet peas, hanging baskets, geraniums and tomatoes with a morning coffee. Trips to the zoo, parks and paddling pools with my nieces who cartwheel and dance on every spare inch of ground. It is all so perfect. We have had such wonderful weather and we are relishing every minute of it. Since my workshop at the Cozy Club at the end of May I have been obsessed with seaside paraphernalia - I have been making tiny bunting for tiny vintage boats and digging out all of my old ticking in red, white and blue stripes to make cushions, lavender bags and hanging hearts. It is so nice to have a bright white bathroom at last, that I can decorate with pretty handmade things. I have a few more boats to make, a few more hearts and a little drawstring bag to keep my make up in. Mostly though I am spending my time working on a few new embroidery designs that I will be bringing with me to the brocantes at the end of August. Sign up for our newsletter, below, to get advance notification of sales and Little Green Door news! Speak soon, thanks so much for popping by. Ever since buying Fiona Cairns Seasonal Baking Book earlier in the year I have been obsessed with edible flowers. Some of the prettier and more unusual types are not growing in my garden (yet!) but I do have an abundance of violas which, I think, are super cute. My only tip here is to use cooled boiled water so that the ice is clear. My flowers sat on the top of the ice cube as I filled the tray to the top and dropped the viola in. If you want to make sure the flower is in the centre of the cube then just fill the tray half full first when putting the flowers in. Once that part has frozen you can top up with more water and freeze the rest of it. Easy peasy. Here's to a sunny summer, right?! Fresh, hot, coffee. Pink roses. New skeins of embroidery thread. Old, slubby, linen. Little bowls of pastel coloured sweets. Long chats with friends on the telephone. Giant jammy biscuits. Taboo on the telly. Long walks in the winter sunshine. A niece with glittering eyes and rosy cheeks; happy after her first day at a new school. Catching up with family over fish, chips and mushy peas. Thick watercolour paper and little tubes of paint. Art class. Bath salts and lavender oil. Heirloom quilts. Homemade banana bread, pots of tea and stitching with friends. Beautiful hand-dyed yarn. Tiny clay hearts. Old tins filled with art supplies. Kindle library books. Miniature zinc buckets for collecting threads. We are a bit out of sorts here. Andrew has ruptured his achilles tendon which means he is in plaster and on crutches. Minimum of 8 weeks to recover and months of physio for him. I am responding every five minutes to requests of "could I have a glass of apple juice" and "would you mind fetching my book for me". The poor chap can't do anything; he is thoroughly miserable and I feel so sorry for him. Hope he heals quickly, for both our sakes! It was Izzie's birthday on Saturday. She is now 8 years old and very tall (with lots of beautiful dark hair), very intelligent and super-affectionate. She loves to dance and is always doing little shimmies and dance moves, often absent-mindedly. Her appetite for reading is huge, her bookshelf is crammed and she devours all kinds of stories. I am lucky to have a close relationship with her and I adore her. I would do anything for her. So when she and my sister asked (at the last minute, natch) if I would make a rainbow cake for Izzie's birthday, of course I said yes. Trolls is Izzie's favourite film at the moment (in fact, she saw it today at the cinema for, I think, the fifth time) and if you've seen the film you will know it is allll about the rainbows! So I promptly ordered a pack of little figurines, a set of rainbow food colour gels and googled the instructions. I have had a half-hearted attempt at colouring cake batter previously; I used a ridiculously small amount of food colouring and ended up with a slightly peachy-coloured sponge when I was attempting for Battenberg pink. This time I was generous with the colouring and got it everywhere . My fingernails have splodges of violet and green, despite multiple scrubbings, and earlier this evening I noticed a drip of red colouring down the kitchen cupboard. This, my friends, does not make me happy! The cake ended up really tall and skinny so I added some support by poking a few wooden skewers through it. It still tilted slightly but what the heck, I knew it would be pulled apart by a pair of kiddos. I covered the cake all over with buttercream and made some rainbow coloured lettering and stars to decorate the top. The little troll figurines circled the bottom of the cake. I was apprehensive about cutting into the cake. It looked okay when I was putting the thing together but you never really know how these things are going to work until you cut through them, especially because the outside of the cakes had 'browned' to an odd colour in the oven. Izzie gave a little gasp of glee as she pulled out the first slice and Ellie's eyes lit up! Such a happy auntie moment. We all had [giant] skinny slices of it with coffee after our food and it tasted fine too. Not as delicious as my usual cakes because I followed a recipe that made the cake firmer and less buttery but it was good enough. 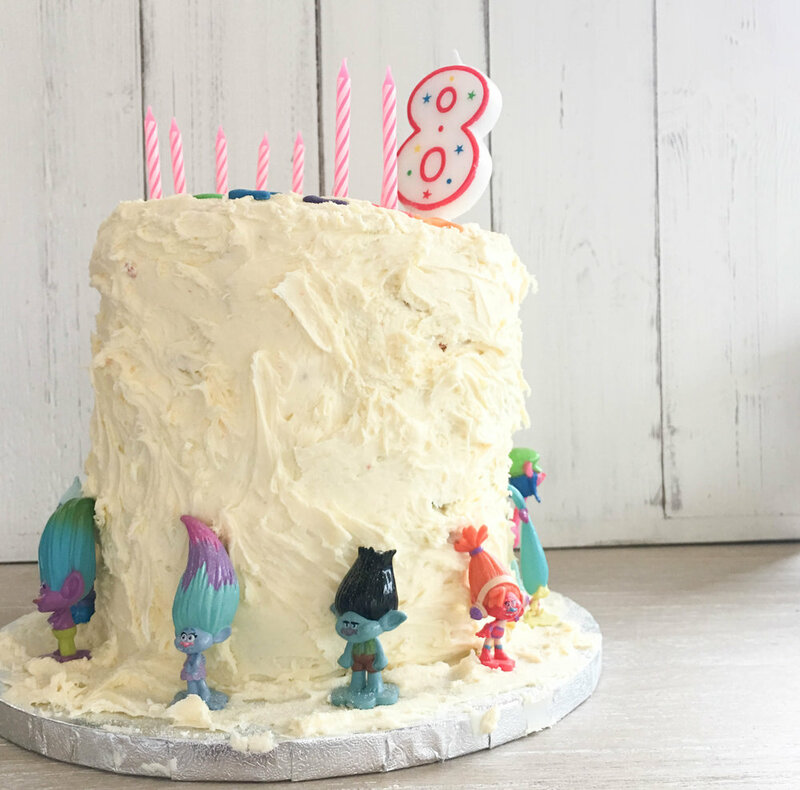 I have made nearly all of Izzie's birthday cakes over the years, I have shared them previously on my old blog but as I am about to close it down I thought I'd post them here. I have never made Ellie, the youngest, a birthday cake and I think it is about time I started. Thanks for popping by. Have a lovely week. Have you heard that today is 'Blue Monday'? I am not sure I believe there is any science behind it and I kind of agree with Innocent Drinks that it was made up by someone in Marketing. However, it does seem plausible. As someone who has battled with bouts of anxiety and depression (thankfully less often these days than in previous years), I have to be extra kind to myself at this time of year. I have found lots of tips and tricks to help support my mental health; principally mindfulness and meditation but also yoga, aromatherapy, journalling, knitting and chocolate. I used to hate winter. September through to 31st December was (and still is) my very favourite time of year but as soon as New Year's Day hit I would feel the familiar dread and despondency of the looming winter months. I know that I am not alone and many of us feel like this, to varying degrees. So far this year, though, I am loving winter. Loving it! So, I thought I'd share some of the little things that are giving me joy this January. I prepared well. My Christmas list consisted of mainly books, craft kits and art supplies. I chose a few books with winter themes and they were gifted to me by Andrew as a cheering 'bundle of books' to snuggle up with on the dark evenings. My new year resolutions are joyful and spoiling. No strict diets, exercise regimes or money-saving schemes for me just now. My number one resolution was to buy myself flowers every week. So far, I've nailed it! Daffodils were on sale in Aldi for 95p a bunch last week and I bought some hyacinth bulbs in Sainsbury's for the price of a coffee on Saturday. Although the hyacinths are just shoots at the moment, it is really cheering to have some greenery around the place. I walk every single day. Lizzie gets dragged out, rain or shine, and at the very least we do a quick circuit of the village. The fresh air and even the drizzle make me feel alive after a day working indoors. Soup! I am working my way through one of my favourite soup recipe books. Very little food is more comforting than a hearty bowl of soup and hunk of crusty bread. Great way to eat more healthily too, as the ones we love most are chock full of veg. Something to look forward to helps; I am no artist but have signed up for weekly watercolour classes that start in February. I took my first lesson in mid-December just before the teacher finished for the year and I am champing at the bit to start properly. Self-care is always important but feels especially good when we have slipped into a habit of being hard on ourselves. Gabrielle Treanor launched a free seven-day e-course called The Warm Embrace this year. I have so enjoyed receiving her gentle emails, reminding me to look after myself and be kind. The course is based on mindfulness and positive thinking - there is still time to sign up if you are interested and Gabrielle's website is packed with uplifting articles and photography. Candlelight... Ah! We all know how much I love candles and these antique black candlesticks in my shop are my absolute favourite. I have them dotted around the house and use small pillar candles from Ikea which last ages and melt very prettily. They make me feel Dickensian and cosy, trick me into thinking I live in simpler times. 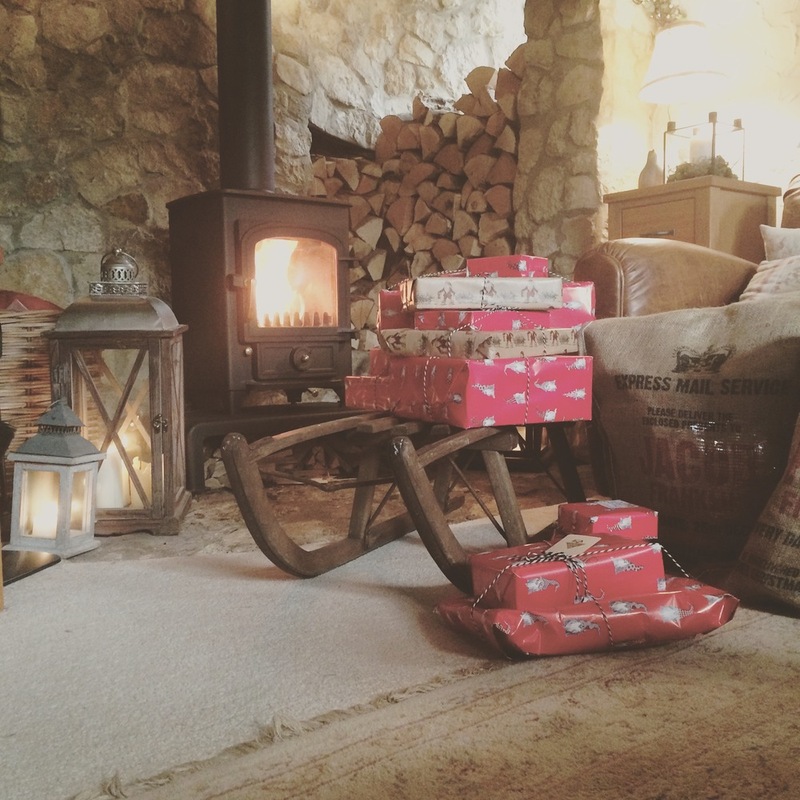 They are rustic and old-fashioned and coordinate nicely with our black cast iron woodburners. Treat yourself here if you fancy; I promise you will love them! I hope my approach to winter will help if you struggle at this time of year. If nothing else, maybe it will be comforting to know that you are not alone. If you have any other happy little tips it would be great if you could share them here or use my hashtag on instagram and twitter #blues_busting. I also recommend the hashtags #savouringJanuary2017 and #making_winter for some cosy, soul-warming photos. With my very best wishes for a joyful and healthy 2017. Thank you for coming to visit this little webspace of mine, it is so nice to have you here for a virtual cup of tea every now and then. Being prone to bouts of depression, my friend Lynda and I have embarked on a bit of a personal development journey together this year to maintain our wellness, mindfulness and positivity, and look after each other. We regularly send each other little gifts in the post, meet up for coffee, and share book and film recommendations. We both love books about Hygge and in one of the books, 'The Cozy Life' the author recommends a 30 day hygge challenge. We both loved the idea and as November has just 30 days we thought it would be the perfect month. Forget the 30 day squat challenge, or the 30 day ab challenge - 30 days of hygge sounds much more nurturing and enjoyable! Make a proper hot chocolate, with all the trimmings. Read a favourite book from your childhood (mine were The Hundred and One Dalmatians and White Boots. Lynda's favourites were The Secret Garden and Little Women). Bake bread (make two loaves and deliver one to your neighbour as a random act of kindness). Hang a new string of fairy lights somewhere in the house. Buy and enjoy a new bubble bath. We like Philosophy Fresh Cream, Origins Ginger Float , Philosophy Cinnamon Buns L'Occitane Lavender Harvest and Jo Malone Pomegranate Noir. Make a breakfast picnic, pack a cosy blanket and watch the sunrise. Go for a walk to gather pretty leaves, twigs, feathers, berries, flowers and nuts then make a nature mandala with them when you get home - photograph or sketch it then destroy it, making a wish as you do so (taken from How to be a Wildflower by Katie Daisy). Enjoy an outdoor fire; either attend a bonfire party or have drinks and snacks around a fire pit at home. Wear a gifted item of jewellery that you have not worn for a long time. Cosy up with a favourite film from your childhood. (Lynda loved Swallows & Amazons, I liked The Sound of Music and we both loved Willy Wonka and the Chocolate Factory). Go for a walk in the woods and kick some golden leaves. Choose a new novel, grab a blanket, hot drink and a scented candle and spend the afternoon reading. We have read and enjoyed Florence Grace, The Lake House and The Girl in the Photograph recently. On our to read list we have Yellow Crocus , I Remember You , At The Edge of the Orchard and A Memory of Violets. Dress your bed with fresh, clean, brushed cotton linen. Make a homemade gift for a loved one. Take your book/knitting/sewing/journal/sketch pad to a cosy cafe and spend an hour on your chosen craft with a favourite drink. Give yourself a facial and get an early night. I am loving this mask at the moment for brighter skin and tighter pores. Get comfy by the window and quietly watch the birds outside. I love to feed the birds and find they like suet blocks, sunflower hearts and nyger seed best of all. Go and visit a friend or family member you've been meaning to see for a while. Take some flowers and give them a big hug to let them know how much they mean to you. Blow the dust off your board games and spend an evening away from the TV. Wine, snacks and a favourite music playlist make for a lovely night in. We always enjoy a game of Harry Potter Cluedo! Try out a new farm shop cafe for breakfast, cake or lunch. Visit a National Trust property and wander around the gardens. Spend an entire day watching a new boxset. Style your hair differently or accessorise with cute clips, flowers or combs. Wear a warm sweater with comfy leggings and spend 20 minutes on some candlelight meditation. Treat yourself to a restorative yoga session somewhere beautiful. Sort through your digital photos and print off your favourites for your own hygge journal. Invite family over for Sunday lunch. Light a scented candle. 1803 Candles are our very favourites; we love Weathered Crow, Banana Walnut Cake and Yummy Pumpkin Seeds. Do some colouring in. We love the Johanna Basford ones and there is a lovely Christmas version out now too. These are just suggestions of course - if you have any more you can add then please pop into the comments! We'd also love to hear the books and films you've loved. If you'd like to read more about Hygge and cosy living, we really loved the The Little Book of Hygge, The Art of Hygge and, of course, The Cozy Life. For mindfulness and positivity reading we love Flow magazine and Breathe. Day one of #30daysofhygge for me was a walk in a local country park with my folks this morning, kicking golden leaves and searching (unsuccessfully) for fairy toadstools. I am so excited to welcome October and release the final Autumnal scented candles that we have in stock from 1803 Candles. 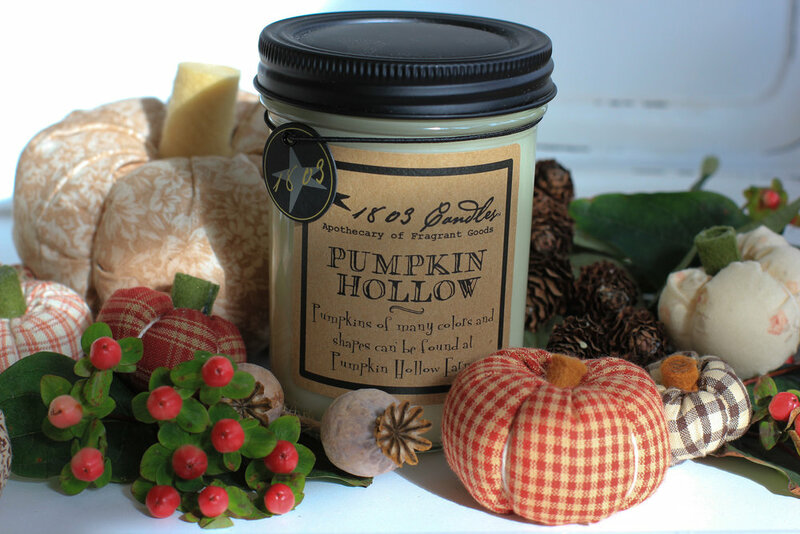 Hocus Pocus, Yummy Pumpkin Seeds and Pumpkin Hollow are all really gorgeous autumnal fragrances and their jar labels are very festive! Perfect whether you go all out for Halloween decorations or like to give just a subtle nod to the season. Shop now here! I have lots of plans for October, both from a work perspective and personally. I had fun updating my Bullet Journal this afternoon with my plans for the month and I have written a blog schedule so that I can blog every day without having writer's block. I was given the all-clear to wear contact lenses again on Thursday as my eye has healed. Hooray! I am taking it steady and only wearing them for short amounts of time at the moment but my mood has improved vastly! It is so nice to see properly without a thick and heavy pair of glasses on my face that steam up every time I pull something out of the oven or slide down my nose with sweat. It is also brilliant to be wearing make-up again and remember that I do actually have a pair of eyes rather than two tiny raisins squished into my face (which is how I felt in my specs). Oh! And I can drive Mabel, my new little car! My lovely friend Lynda (Laalaa) came to visit me again yesterday - we have managed to get together loads this summer, it has been great - and we had a proper tour of Northamptonshire in my minty pride and joy. We had such a lovely day fabric shopping, stationery shopping, lunching and drinking coffee. Although it has to be said, Lynda still gripped the door handle a little too tightly when I was driving, I think I still scare her even though Mabel is much slower than my Mini. To top off a lovely day I went to an aromatherapy class at a divine yoga studio yesterday evening with Debs. There's really nothing better than spending time with treasured friends is there. We are going to settle in front of the TV now to start Season 3 of The Bridge. We have boozy drinks, blankets and a bowl of Hula Hoops. Perfect Saturday night in doncha think. It has been all over social media today; the first day of Autumn, officially! The Autumn Equinox. It has been a beautiful day. The sun has shone but it has been pleasantly cool. I started the day slowly with my knitting and a cup of coffee, watching the birds feeding in the garden. It's nice now that the hedges are losing their leaves as the birds are more visible. The longer I sit, the braver they become; I could spend the whole morning there given half a chance. I like to start my mornings slowly and mindfully where possible as I find it a really positive way to begin the day. I try to get up when Andrew leaves the house at 6:30am so I have a good hour to dedicate to breakfasting, knitting and quiet reflection. I also use that time to review my bullet journal and the things that need to be done that day. These last two weeks have not been ordinary for me at all. Having damaged my cornea last week I have had to take time out to rest and recover. With my eye particularly sensitive to light, it has been difficult to watch the television or use my computer screen for any period of time and so I have been mostly listening to audio books, stitching, knitting and snoozing. I have had lots of (mainly edible) presents delivered from my lovely friends and Debs came to fetch me yesterday to take me to knit club at a cosy cafe. It was only for a couple of hours but so nice to see the knitting ladies again over tea and crumpets. Fingers crossed, I am over the worst of it now and feel much better. The sun was shining when Andrew got home from work and so after a hasty snack for dinner we laced up our walking boots and headed for the nature reserve with the dog. The sun was just setting and the hedgerows were laden with rosehips, berries and crab apples. The meadows were alive with rabbits and the sky was full of flying, honking geese. It was, as always, utterly peaceful and I feel content having ended my day in much the same way as it began. I am off now to finish writing my Autumn bucket list; I have a cosy blanket, hot tea and fluffy pink slippers waiting for me. Then - excitingly for me - I have new beauty products to try including a pumpkin enzyme face scrub and avocado night cream. A cheer-up gift from my lovely man. The time right now, as I start this blog post, is 7.55pm and it is very dark outside. I have got my woodland lantern burning alongside a new 1803 candle (trialling a Halloween scent - love it) and a big pot of soup bubbling in the Aga. Andrew is playing football tonight and he'll be home soon. It is cool outside but not cold (today was a pretty warm day) so as soon as he has showered I will fill two bowls with the soup, top them with shaved parmesan and we will sit outside to eat. These are late summer days at their best... the glorious slow transition to Autumn. I am savouring every moment. My work tray holds an embroidery commission that is very nearly finished and I am joining a friend tomorrow afternoon to work on it whilst we have a catch-up. I am spending tomorrow morning with my parents; we are taking a breakfast picnic to watch the sunrise and, hopefully, a few water birds down at the scrape. I love our mornings at the nature reserve; such a gentle yet energising way to start the day. I hope everyone is having a lovely week and not feeling too thrown with the children back at school. I am sure it takes a while to get back into the flow of a regular day. September is my favourite month, without a shadow of a doubt. Firstly because of the weather. Although the summer sunshine tends to linger for much of September, the light becomes more golden and the mornings and evenings are considerably cooler. My favourite weather. It also, of course, heralds the return to school and reminds me of those exciting first days of newness. New teachers, new timetables, crisp new exercise books, new pencil cases and shiny new school shoes. Gleaming freshly waxed parquet flooring in the school hall. September is a bit of a romantic month in our family; we all chose this month in which to be married. It is actually my folks' wedding anniversary today(I think 43 years). Congratulations Mum and Dad! I am looking forward to watching the changing of seasons at the reserve. In the last few weeks we have already seen the blackberries start to ripen. Apparently, as the blackberries go over the bull finches enjoy feasting on their seeds. The starlings in our garden must have moved on because the tray of mealworms on my conservatory window is still full. Usually the starlings show up like a gang of over-excited teenagers, scrapping and bickering as they eat. I kind of miss them although I do not miss the mess they make. I am making plans for Autumn and I'll share them with you next time. Plans include the embroideries I am going to stitch, films I am going to watch, wristwarmers that I am going to knit and the cakes I am going to bake. We have taken delivery of some gorgeous 1803 Candles in cosy autumn scents and I've listed some on the website this afternoon. They launched at lunchtime today and there was an exciting flurry of activity as people stocked up. Perfect Pumpkin and Apples & Acorns have been the favourite so far; stock of those is almost depleted. Pop over and have a look - if you haven't tried 1803 before you won't be disappointed. They are by far the best scented candle I have ever come across. The scent fills a room without being overpowering; very mellow and gentle. The fragrance lingers too - we had the bathroom refurbished earlier in the year and one of the workmen told me how lovely and cosy the house always smells. He took a big breath in and said: "ooh your house always smells lovely; like baking. Very homely." He made my day! Have a happy September and enjoy the slow transition to Autumn, dear cyber friends! PS The mouse situation has been dealt with. We have two humane traps in the yard and have caught four mice so far. I haven't seen any around lately either. We are used to having mice in the garden at harvest time so it doesn't worry me. The traps were down for a couple of days and we had failed to catch any of the pesky rodents; I was starting to feel concerned that humane traps were not aggressive enough. Eventually, as I popped out to grab a coffee last Friday I announced, in the general direction of the garden, that all mice had better surrender themselves immediately or I was bringing the 'snappy traps' out. Lo and behold upon my return two field mice were ensconced in said plastic boxes, quietly snacking on giant chocolate buttons. I like to think they recognised my non-nonsense tone! Of course I had to summon Andrew from his office (thankfully he is based just down the road and was local that day). He released them in a layby near his office and has felt compelled to release all subsequent mice there "in case they are family and miss each other." Ha! I totally get that. Today is the hottest day of the year, so far, apparently. I am loving it.... l o v i n g i t ! I don't even care that I am simultaneously battling a summer cold and hayfever (an ugly combination). I have put my swimming costume on under my dress and I'm playing musical chairs in the garden, chasing the sun. For now, I've moved into the living room - the coolest room in the house - to keep Lizzie company. She keeps following me into the garden and lays in the hottest part until she pants as though she is about to expire. It worries me a bit. I've got the windows open, a bunch of roses in my new (to me) enamel coffee pot and a Lavender Lemongrass candle on the go. I've got washing on the line and the house is getting properly aired with windows flung wide open. Dinner is going to be homemade burgers with sweet potato wedges and salad, followed by homemade honeycomb ice cream. Life is good! This is my first summer working for myself and being my own boss is still a massive novelty. At the bank I could've been sitting in a meeting in London, Leeds or Edinburgh right now, not wearing a swimsuit in the garden and floating around with my glass of pop chinking ice. One word: wahoo. Of course, I need to exercise a little discipline too. If the good weather continues I am still going to have to set aside some time to photograph our new products and of course daytime is essential for nice, bright shots; I can't wait until the sun has gone down. We sat outside last night with all of the outdoor lanterns lit and the garden looked magical. I think people tend to mainly buy lanterns in the winter but they are so perfect outdoors on a dry evening. We have been working on the garden a little this weekend. I am trying to focus on perennials but couldn't resist some lavender bacopa and pale pink diascia at the weekend (the diascia I planted in apple crates last year has survived the winter and is blooming even larger than before. I'm really pleased, it looks so pretty). The weekend was a lovely mix of housework and relaxing. We went to see Ghostbusters on Sunday evening and both of us loved it. We thought it was hilarious but I think we were the only ones who did! We were the only ones laughing for most of the film, ha! I'd better crack on and get my work finished for the day so that I can get back out into the sun. I am starting a monthly newsletter for the Little Green Door and if you sign up you'll get free stuff, discounts and special offers. I just need to work out how to add the 'sign-up' button to my website*. *edited to add: I blinking did it! At the foot of the website or on our contact page you can now sign up to receive our newsletters. You will not receive spam, I will not pass on your details to ANYONE and I will not email you more than once a month, pinky promise. You'll get a 10% discount code for your trouble. Thank you! For new readers, Izzie is my eldest niece. She came out with this little gem, conversationally, as we snuggled under the covers last time she stayed over. I think she was a bit scared, spending the night in a creeky old cottage, and these words of wisdom were casually imparted as she lined up a small army of cuddly toys, on the pillow next to her. My husband had, kindly, moved into the spare room for the night so that Izzie and I could share a bed. All I can say, after sharing a bed with Izzie for the night, is that I can understand why sleep deprivation is considered a form of torture. Several times, just as I was about to drop off, I had a sharp jab in the ribs or a stage-whispered "Auntie Nicki, are you asleep?". Eventually, I was asked to make up a story. I told her I would if she just closed her eyes. Making up a story sounded like a doddle to me. I write short stories and make up little children's tales in my head all of the time. But at 10pm after a day of intense activity with aforementioned 7 year old, my tired mind was blank. I gingerly started the story of Princess Clara who lived with her mummy and daddy in a beautiful, crooked, stone castle... "What colour was Princess Clara's hair, Auntie Nicki?" My response - long dark hair - satisfied the brunette little girl next to me for a few seconds. Until I mentioned Princess Clara's long pink gown and sparkly pink shoes. "They sound lovely Auntie Nicki.... I have a pair of blue sparkly shoes you know. They're my party shoes..." And on it went. The story became a conversation with Izzie constantly interrupting to question a detail ("I thought you said his coat was blue?") change the name of a servant or the words of a spell. Telling her to close her eyes as I recited the story only led to the pair of us trying to secretly peer at each other with one eye squinted open, quickly closing it as we spotted the other spying. Iz fell into an exhausted slumber at 10:30pm and I slept fitfully for the rest of the night waking on the hour to check that she was still breathing. This, I remind myself, is precisely why I would make a rubbish (and exhausted) mother. Those words about cuddling have been playing on my mind ever since, though. You really do feel safe when you cuddle. Giving someone a long, tight, hug during their panic attack can be a real help (it is for me). When I was ill with anxiety and depression last year, my counsellor recommended I bought a teddy bear, for cuddles when there was no one around to administer them. On the basis that I have a very placid and tolerant dog at home, I didn't buy a bear but if I had, I'd have chosen one of the ones I now stock in the shop. Pop over and have a look - perfect for big or small children and uber-snuggly. I have more Maileg toys coming soon, complete with pyjamas and other, fancier, outfits. My nieces give me the best excuse to stock them. Last weekend, when the Maileg order had just come in, Izzie (7) chose the large fluffy bunny and Ellie (20 months) chose the tiny mouse in knickers. Truffle the pig is my favourite! Have a lovely weekend and thanks for popping by. Hello hello and happy Friday! The weather is awful here today. There is a thick blanket of greyish cloud and a fine drizzle just hanging in the air. Most unpleasant. It is the perfect day to get cosy indoors. I have been really busy this week and haven't spent much time with Andrew. I am looking forward to him getting home from work tonight so that we can cuddle up together and have a relaxing night at home. I think my mum has taught me well when it comes to having a cosy home and making the small things special. One of my favourite memories of my childhood is coming home from school on a cold and murky afternoon to a snug house and cup of tea. We never had the overhead lights on at home, our rooms were always lit by cosy little lamps on tables and dressers any time it was a little bit grey outside. We had a lovely gas fire which would be switched on ready for us getting home and there was a little marble surround where I'd rest my tea and a couple of Golden Crunch Cream biscuits. How I loved sitting in front of that fire with my sister, dunking biscuits and watching Jackanory whilst mum cooked tea. I know it's just a really small thing but it had a big impact on me and I never took it for granted. I love to try to give Andrew that same sense of wellbeing when he gets home after a grotty day at work. So, tonight I am going to light the candles and lanterns, get a fire going and make something comforting for dinner. We have lots of episodes of Broadchurch to catch up on and I quite fancy a boozy drink in front of the TV. We are off out for the day tomorrow so I'm hoping the weather improves. It was lovely here last weekend and we made the most of it by heading out to the pub in the village next to us. We are quite lucky to be surrounded by lots of nice country pubs, many of them bistro-style with good food and the modern country decor which I love. I'd spent the morning baking (with Lizzie following me around the kitchen like a shadow) plain vanilla fairy cakes with pastel icing and sugar flowers. It felt like spring was on its way then. What happened?! Have a lovely weekend and keep cosy. Hello hello! It is 5am and I am writing this post from my kitchen with a mouthful of strawberry jam sandwich. I woke up half an hour ago thinking of strong coffee, bacon sandwiches and white chocolate shortbread. Unfortunately for me, our food cupboards are a bit skinny at the moment and so I had to resort to my usual bare-cupboard-snack. It's actually quite delicious. I am a bit excited, too. I am making lots of Easter pretties at the moment and have already had lots of orders for my Easter bunny wreaths. I love making them and can't wait to send them off to their new homes. My newly-retired dad has been teaching me woodwork and the fruits of my labour will be listed here as soon as the paint's dry. We had torrential rain here yesterday. The road outside our house was almost entirely underwater and the neighbour was out in his wellies, paddling around in his garden. We live on a bit of a hill and it is unusual for us to have such a lot of water outside. It was gushing down the road and passing cars were creating waves as tall as me. My friend and sister who both live in Market Harborough were sending me photos yesterday of various areas in the town badly affected (note to residents: do NOT use that overflow car park for the Market Harborough train station. Apparently it often floods in bad weather and you'll lose your car.) My niece's school closed urgently as the lane was knee-high with water - she cried as her dad collected her. She told my sister that she is desperate for school to be open today because she "likes to learn". Oh, the cuteness of a 7 year old. It occurred to me yesterday that I have done it - I have made it through the worst of the winter without feeling depressed. Yee-ha!! The days are getting longer, the dawn chorus is in full throttle from 4am and tiny muscari and tete-a-tete are bobbing their heads around the house. The relief! I think it is a combination of finally finding the right job for me but I have also allowed myself time for indulgences. Naps almost every Sunday afternoon, cake whenever I fancy (no dieting allowed until the clocks go forward) and lots of lovely binge-TV by the fire. A few new goodies have arrived here for the shop recently and I put them all up on the website yesterday. They are all gorgeous; my current favourite is the large wicker tray which is a good sturdy number large enough to carry two dinner plates and a couple of drinks into the garden. I also love the little rusty crown tray and can't wait to load mine up with Easter treats. Have a butcher's, and don't forget that orders of £50 or more qualify for free scented candles. Finally, I have listed the Walther & Co zinc houses. Walther & Co has the biggest and best selection of house lanterns and each one is of impeccable quality and, of course, stunning Danish design. I will be ordering more later in the year and it's never too early to start your collection. I have managed to get my hands on quite a few over the years and they looked so pretty at Christmas, creating a winter village. For the rest of the year I just dot them around the house in pairs where they twinkle prettily. Have a fabulous Thursday, my lovely friends. I am feeling peckish again so I'm going to make another teeny sandwich and find a cosy corner to curl up with a book for an hour or so. Hello hello! I am going to start by saying happy birthday to my lovely dad. He's had a bit of a rubbish day by the sound of it so I want to just remind him how ace I think he is and how much I love him. (I'm also a bit broke, dad, if you've got a spare tenner?....) Haha. It's my friend Mel's birthday too *waves* happy birthday lovely! It has been so windy these last couple of days, I hardly slept a wink last night. I know that our house has remained standing for 400 years but it still gives me the heebies when I hear the wood beams creaking and the window frames rattling. I am not a fan of being outdoors in the wind - it gives me horrible earache. Lizzie no likey either, so we've stayed in all day. I got some knitting done (I have joined in with the Martin Storey knit along for Rowan) and watched the last few episodes of The Affair. I really loved that series. Loved it. I did not love Noah (in fact I felt quite repulsed by him) but Cole goes a long way to restore your faith in a chap. The scenery and cinematography was a treat. Next on the 'To Watch' list is War & Peace. I've recorded them all and haven't watched a single one so I will pick a quiet day when I can watch them back to back. So excited - everyone seems to have loved it. The Lavender Lemongrass and Cabin on the Hill are both quite fresh, outdoorsy scents. Hearth Cakes and Friendship are cosy, spiced baking scents. All are lovely. I don't know which to light first! More, larger, ones are en route as we speak. The next lot are in mason jars with black lids, still very rustic and primitive in a few difference scents. It is so nice to have found a good scented candle in an attractive jar. So much nicer than Yankee Candles and I even like them more than my old favourite, Bath & Body Works. I urge you to try them! You won't look back! I've also had a bumper delivery of fabric ready to be transformed into lovely things for the Lollyrocket fair on 27th February. I will, of course, be listing some handmade pieces in the shop too. I had carved out the whole of this week to break the back of my to do list but so far haven't even switched on my sewing machine. I will definitely *definitely* start tomorrow. No more procrastination. Enjoy your week, everyone. Thanks, as always, for stopping by to read my ramblings. Hello and happy Monday. Yay, we got through it! It has been so grey here in South Northamptonshire. It doesn't help that we live in a tiny cottage with thick walls and small windows - it's dark at the best of times. Today I have had all of the lamps on and candles burning constantly. In all honesty, I have felt a bit pants today. I'm just getting over a nasty cold and feel very rundown and sluggish. I also have a bit of hormonal rage (TMI?). Nice combination. So, I took a bit of time out this morning to watch a couple of episodes of The Affair and do some easy knitting. Have you seen it? I didn't watch when it originally aired so I have two lovely seasons to binge on. I am loving it. Such a crazily stylish programme, I love Ruth Wilson's beachgirl wardrobe. It makes me dream of summer days in cotton dresses and tan leather sandals. It also makes me pine for a more simple life - Alison and Cole's beach house has that shabby but stylish thrown-together look. It is basically like watching a Toast catalogue brought to life. Heaven. I have just finished a pair of gorgeous fair isle wristies but I didn't bother knitting a swatch and they are much too small. I am going to have a very cosy niece. I've also started knitting a pink Tess heartwarmer and will soon start the Martin Storey knitalong for Rowan. The wool should arrive from The Wool Sanctuary any day now. Yay! Anyway, I didn't stop by to gripe about my day (although sympathy for my cold is always welcome), I wanted to let you know about the gorgeous whitestone pots that I have added to my shop. I planted mine up with hyacinths, snowdrops and lavender this weekend and they look so pretty and fresh in my conservatory. Have a little look when you get a mo. Soups (this, this and this). Furry Fat Face slipper boots. Knitting socks with sparkly yarn. Reading under a blanket with a snoozy dog on my lap. Savouring my favourite Christmas chocolates. Meeting good friends in good pubs. Mittens on string. Binge-watching Grey's Anatomy season 10. Listening to the Grey's Anatomy season 10 soundtrack (amazing 80s covers). Knee-length socks, long dresses and petticoats. Black Forest hot chocolate. Drawing, doodling. Inspiring doodle how-tos on youtube. Lanterns and woodburners. Slow cooked lamb and potatoes; comfort food. Baths before dinner. Yoga by candlelight. And, today, an early morning walk in the snow, at last. Lizzie loved it too. I repurposed my zinc tub for kindling by the fire. This is the larger of the two which I am selling in set in my shop. These glass candle boxes will be in stock soon! Hoping by the end of the week. Winter Cottage and Waiting for Summer, both by Kirsty Elson. I still have a few of each of the candle votives in stock - these are the large and small fluted ones together with the cupcake votives. I have had mine for a few years now and they look lovely year round. So far so good. The January blues haven't hit me yet. I'm not sure if it's because I've had a change of direction in my life or because I've been taking vitamin D supplements, though I suspect the former. It's dark enough to trouble any SAD sufferer though, wouldn't you say? It has been super grey here today and by 2pm I had to admit defeat and switch a few lights on. Inspired by lots of lovely light, bright and white interior photos on instagram this morning, I decided to spruce up the living room a bit. Having removed all of the Christmas decorations, the house felt a little bit less cosy and it suddenly felt like there was too much empty space everywhere (seriously, what did I keep on the dining room sideboard before I set up my winter village? I have no clue.) I started by giving the inglenook fireplace a good going over with a damp cloth and the hoover. Bad move. It was so full of cobwebs that I had to tuck my trousers into my socks and wear a hanky on my head (my Cath Kidston ones are lovely and big for that very purpose) in case of abseiling spiders. Perhaps more alarmingly, there was so much dust that when I turned back around to see Lizzie blinking at me from the sofa, I thought someone had set off a smoke bomb! I felt a bit deflated cleaning the living room, I'll be honest. We chose this house because it is small, cosy and quirky but in these light-starved mid-winter days I wish we'd picked something with higher ceilings and bigger windows. I gave myself a talking to and pulled out all of the candles and lanterns I could find, to cheer things up. I'm pleased with the living room now, it is sparkly clean and fresh. I am definitely going to paint our oak furniture to help brighten things up a little, though. PS Did you see the little Kirsty Elson piece in my photos above? It was a birthday present from my grandma and it's called 'waiting for summer'. I think it looks lovely on the skinny shelves in our living room next to the winter cottage piece I bought for myself just before Christmas. Happy new year! Are you ready for 2016? I am. Anyway, we saw Wicked! at the theatre yesterday in London. It is my new favourite show. At the very start I had a sinking feeling that it wasn't my cup of tea but came out singing "Wonderful, they call me Wonderful" as you do. Loved the whole back story of the witch. Seriously, a sparkly pretty good witch and a green, dark, bad witch on stage together being besties? Perfect. Really want to take Izzie, my little niece, to see it. She would love it. We've had a really relaxed day today and it has been super cosy. Fires roaring in both rooms downstairs and a spoiling breakfast of huge English muffins with smoked salmon and scrambled egg. I'm cooking mac and cheese later and then I promised to join Andrew for a game of Rock Band on the ps4. Can't decide whether to be lead singer or lead guitarist. Decisions. Well, I was rubbish this Christmas. We hosted Christmas for our family for the third year running. Usually (if I may say) we have our lunch prep nailed. 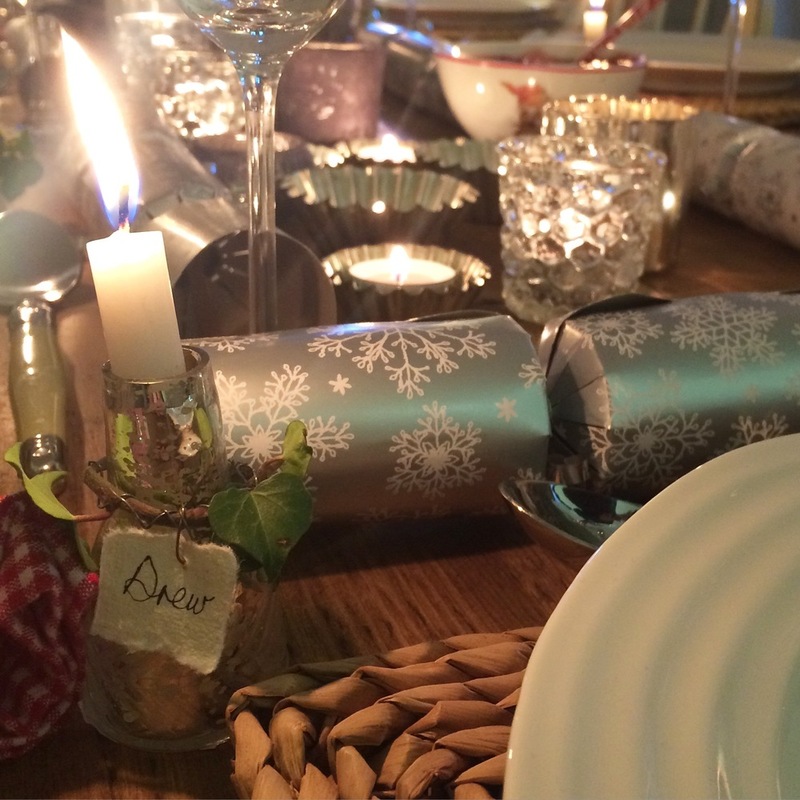 By the time our family starts to arrive, the kitchen is [reasonably] tidy, the smell of roast potatoes and turkey wafts enticingly and I have a glass of ice cold bubbly awaiting everyone. Roasted a gammon joint on Christmas Eve thinking my dad (who doesn't eat turkey) could have it for lunch. Forgot about it, left it in the fridge, threw it away untouched yesterday. Sigh. Made mashed potato after a special request from stepson. Forgot to give him some. Took more than 90 minutes to roast the potatoes (put them on the wrong shelf of the roasting oven). Guests arrived starving. Lunch an hour late. Guests *forced* to eat sausage rolls and Quality Street as amuse-bouches. Burned a pan of maple roasted parsnips. To be fair, I do this every year. I always roast two panfuls: one roasts to perfection, the other burns to a blackened crisp. Kind of an accidental tradition now I think. You know what though, it was the loveliest day. The table looked pretty, my nieces turned up in crazy cute party dresses and the food (again, if I may say) was plentiful and delicious, if a little late. We began our celebrations with white peach bellinis and finished off the day with a few competitive rounds of Giggle Wiggle. Boxing Day was spent, just Andrew and I, at home. We lit a fire, caught up on Christmas TV (Downton Abbey! *happy tears*) and gorged on leftover turkey, cheese, chocolate torte and banoffee pie. Come Sunday we were ready for round two: mum and dad had a little gathering for my extended family. It was cray cray, involving nine children, two of whom were riding around the ground floor on a mechanical mouse. Two others were playing football (soft ball) in the hall. Two more (and a couple of dads) watched Escape to Victory in the living room. My thespian cousin (13) bravely performed songs (beautifully, tear-jerkingly) from Les Mis in the conservatory. The biggest, Tom, spent the day dolling out huge hugs and the littlest, Ellie, simply ran everywhere observing all of the above, admirably avoiding the two on the mechanical mouse who could not stop grabbing her to pat her tiny ponytail. Of course, we still have a few remaining days of Christmas to celebrate. These lovely long lazy days as we prepare for a new year. Reading, knitting, pottering and not doing very much at all. Perfect. *If my MIL is reading this, I'd like to point out that it was a mini squabble and we laughed about it ten minutes later. We are not about to get divorced or anything.